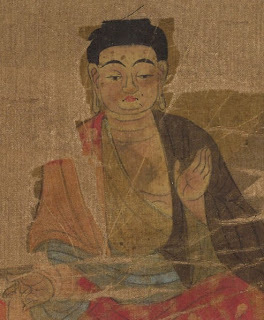 Some time ago I discovered how interesting Buddhist art from ancient China is. It offers a glimpse into how people at the time envisioned the Buddha. 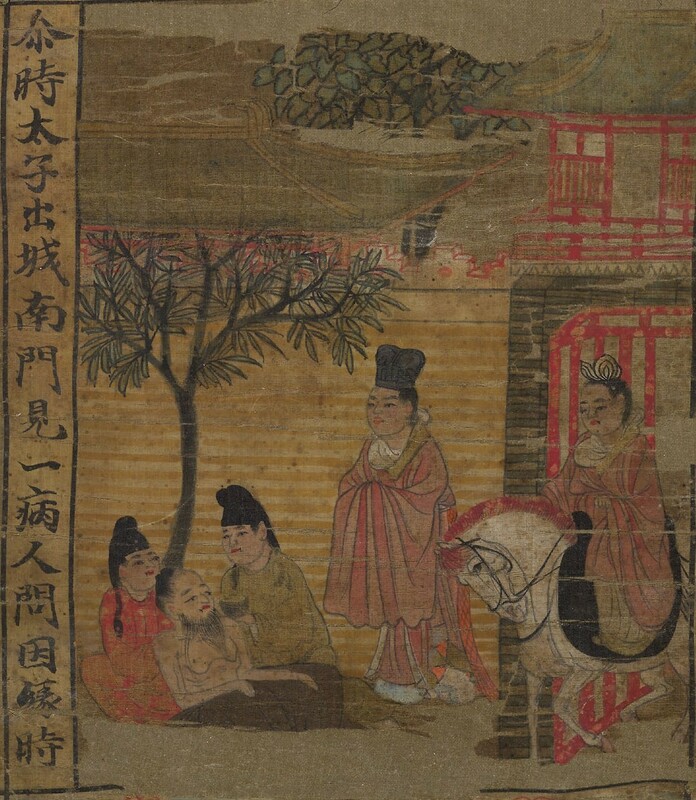 Even in the Tang Dynasty (618-907), when the capital Chang'an was arguably the most cosmopolitan city in the world, I imagine few people had any real sense of how India on the other side of the Himalayas looked like. They had the scriptures translated into Chinese, but lacked a visual point of reference to imagine them in. Hence, the figures from the scriptures are painted in local surroundings and wearing the garments of the time. 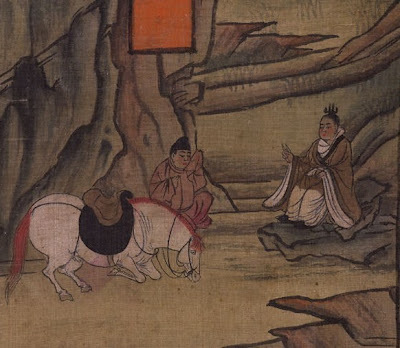 The following paintings are from around the 9th century. (Click for larger views). As is well known, it is said that the Buddha's mother had a dream of a white elephant entering her womb before becoming pregnant. 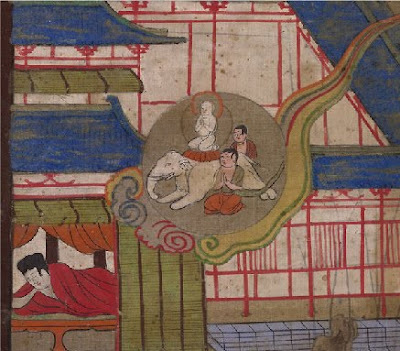 This painting portrays the descent of the Buddha while riding a white elephant with attendants into his future mother's womb. As you will notice, the palace is Chinese, not Indian. 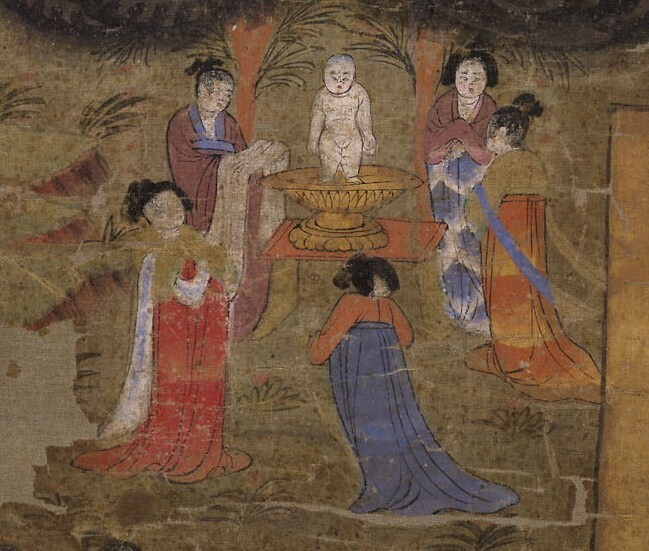 The next image shows the infant prince being bathed in Lumbini where he was born. 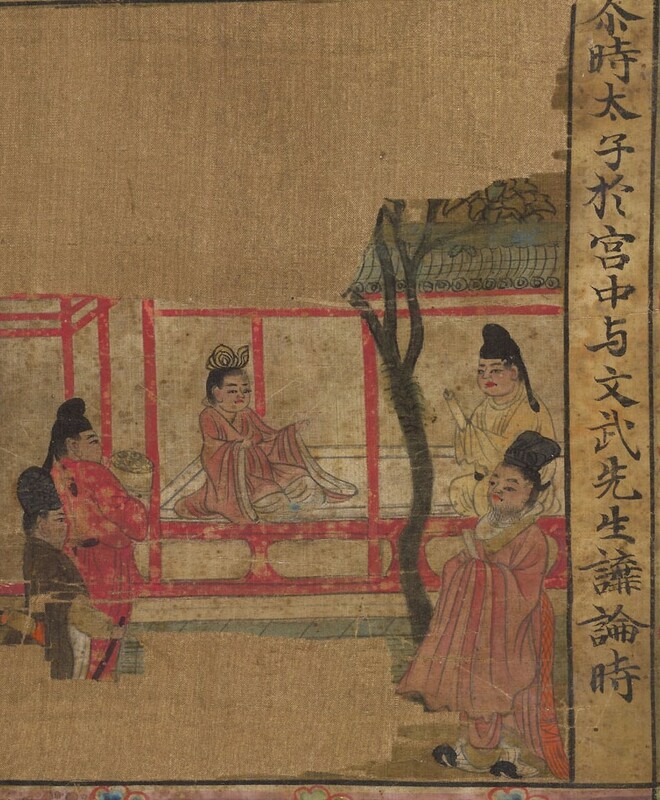 Again, notice that the attending ladies are all wearing Chinese aristocratic clothing. The following is particularly interesting. Here we see the young prince in the palace having a discussion with his seniors. 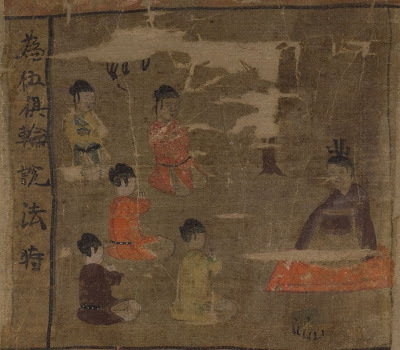 He is surrounded by courtly looking gentlemen wearing the caps and garments of the Tang Dynasty. The prince is also portrayed as a Chinese prince. 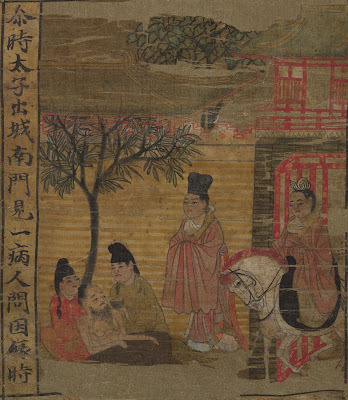 As the story goes, one day Prince Siddhartha left the palace and saw for the first time an elderly person. 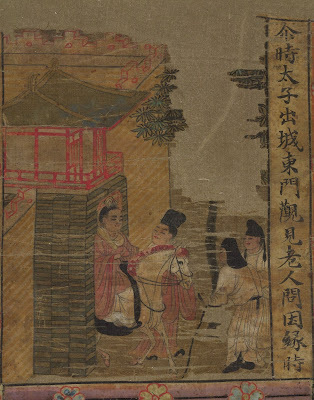 In this image he is seen riding a horse rather than being in a chariot. We see him exiting the gate while looking quite stately and noble. 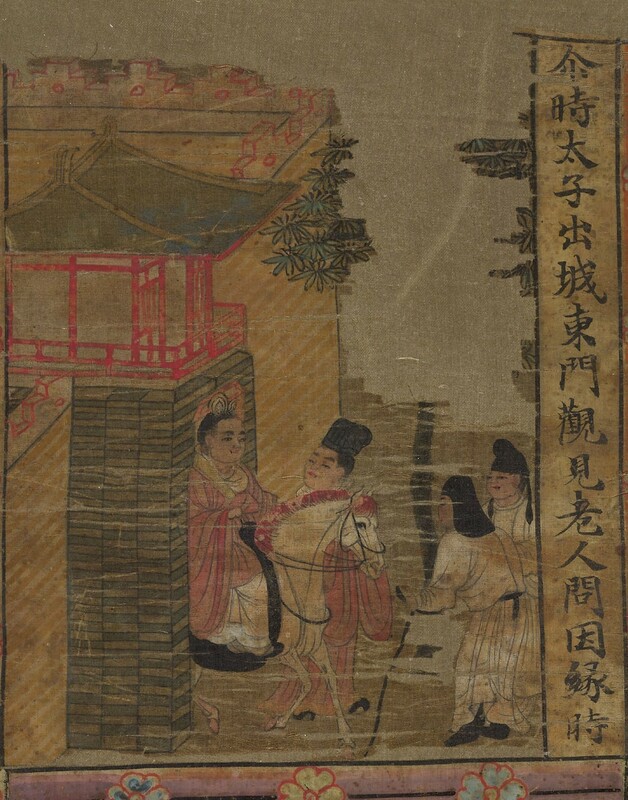 The following day he left the palace again and saw an ill person for the first time. As we all know, these events prompted the prince to give up palace life and become a homeless yogi. In the following image we see the prince saying his final farewell to his attendant. Note how the horse is also bowing in respect. Later, he undertook practices of austerities. 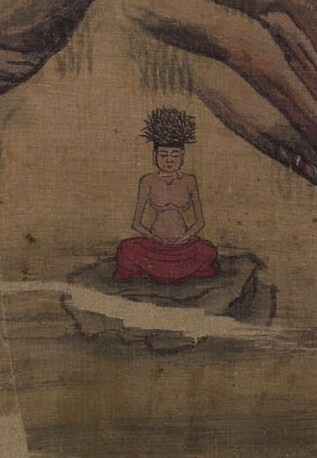 Here we see Siddhartha in meditation with what appears to be a tangled mess of hair on his head. After nearly starving himself to death he finally realized the middle-way and bathed in the river. After becoming enlightened, he went to Sarnath where he took on his first five disciples. 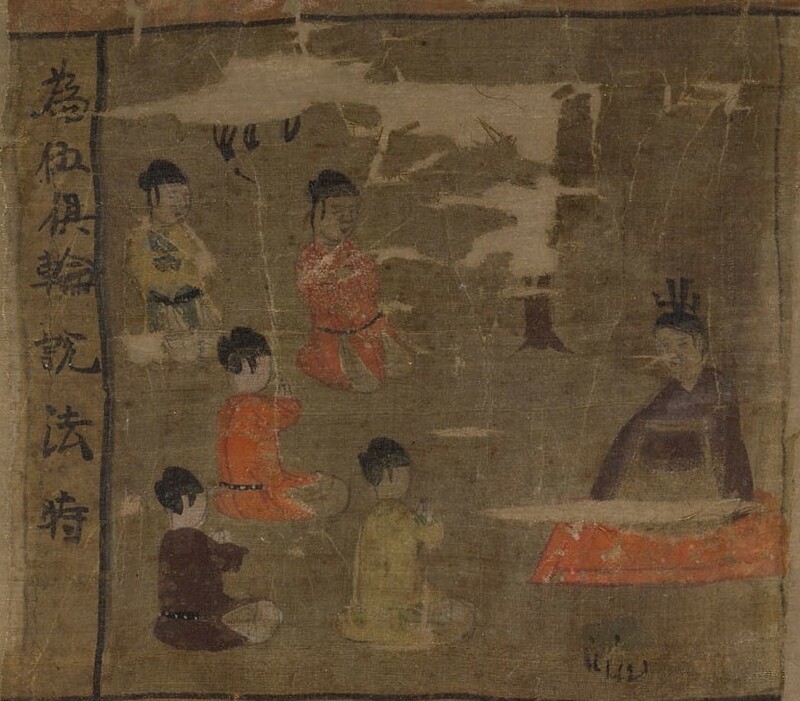 The following image is curious because the five disciples are all ordinary looking figures and not mendicants. 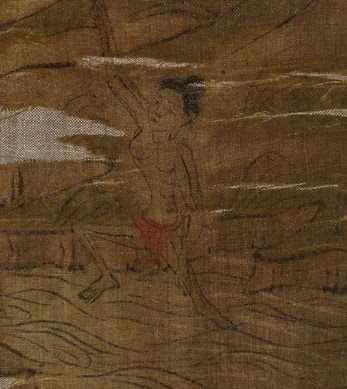 One might assume the artists were aware that Indians in that far away "western region" would have worn different garments and looked visibly quite different, but lacking any reliable reference they just painted using imagery that they knew. Or it might have been that they actually did have some reference (such as pieces of art imported from India or perhaps Central Asia), but just felt more comfortable making the Indian Prince into a Chinese Prince. 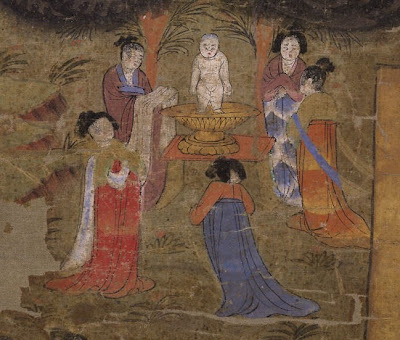 One will notice in the artwork of the time they have bodhisattvas and buddhas normally dressed in non-Chinese attire. I suspect this might have been due to an assumption that it was only holy beings that wore such garments while ordinary people did not. As the image on the left shows, the Buddha is portrayed with elongated earlobes and non-Chinese garments. I very much think the running assumption was that such garments and characteristically unique earlobes were reserved for holy beings, and hence ordinary people are not portrayed as possessing such features. The story of the Buddha's life is perhaps the most beautiful, inspiring and philosophically profound of all the world's myths and legends. Here you have a very different type of hero: not the usual sword-happy Arnie-type, but simply an intelligent, sensitive human being who discovers a wonderful treasure and freely shares it with the rest of humankind. Thanks for sharing the pictures! Are they a collection of paintings on the silk?Where do they come from? I think they're all on silk.